Elderberry (Sambucus canadensis) is a deciduous, perennial shrub native throughout the eastern US and into Canada. It is most commonly found in moist low lying areas near swamps and at the edges of woodlands and lakes. It can also be found around man-made retention ponds, canals and ditches. Leaves persist until dropped by frost, making it nearly evergreen in some parts of its habitat. The plant has an attractive tall and open growing habit with several stems arising from the base, reaching heights up to 20 feet when growing under optimum conditions. Elderberry needs lots of light to produce berries and prefers full sun or slight shade and a moist loamy soil. The preferred method of propagating elderberries is by cuttings, but they can also be propagated from seed or small suckers taken from the parent plant. Mature tip cuttings taken late fall or winter or softwood cuttings taken in spring will root readily in moist potting medium. 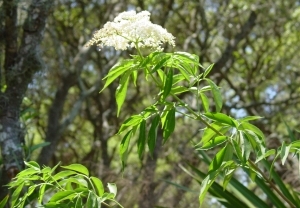 Elderberry begins its blooming cycle of white fragrant flowers in summer, which lasts about 4 weeks. The individual blossoms are tiny, but are produced in showy, broad clusters up to a foot wide. This is followed by a drupe of small green berries which mature to a purplish black color when ripe, near the end of summer and early autumn. Birds, squirrels and other creatures love the sweet fruit and will give you a run for your money if you have intentions of harvesting the berries for your own use. Elderberry fruit is rich in vitamin C and the entire plant has a long history of medicinal use. Elderberry wine is not only delicious, but can be taken as a remedy for sore throat and other related ailments. In addition, the berries can be used to make jams, jellies and preserves. Elderberry is a much overlooked ornamental shrub that offers a valuable food source to birds and wildlife. Grow some, if you have room in your backyard garden. A word of caution; elderberry closely resembles water hemlock which is very toxic and you should avoid skin contact. Both can be found growing in like habitats. If unsure, here are some guidelines to identification. The leaves of elderberry are exactly opposite on their stem, while the leaves of water hemlock are alternately placed. In addition, water hemlock has dark purple stripes on the stems and you will notice hollow sections when cut lengthwise. If still unsure, consult your local plant and wildlife authorities. All content property of BackyardGarden.info and may not be copied or reproduced without prior writen permission.